Interior Features Unusually, open floor plan with very large rooms for family or entertaining. There's a study with long-leaf 100+-year-old pine floors and built-in bookcases. The kitchen was remodeled recently with granite, pressed tin backsplash, farm sink & more. The master suite features a dressing room and more closets than one can imagine. 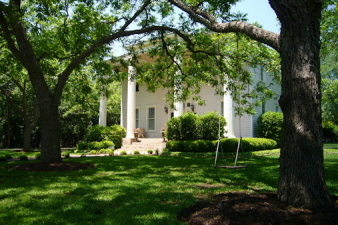 Exterior Features Beautiful .969 acre lot in the heart of San Marcos downtown historic district. This tree canopied lot is set off by a wrought iron fence and brick wall. The lawn is landscaped and features a sprinkler system front and in part of the back yard. There are many producing pecan trees that provide shade and a great income in the fall. A double car garage sets back as an independent building. Behind it is a guesthouse with, central air and heat, full bath and two entrances. Additional Features and Amenities There's a wonderful covered deck for outdoor living and entertainment.